An action-packed second half created some drama for Texas and Ohio State, but some late heroics for Texas claimed them the tourney title. AUSTIN—#8 Texas Melee earned their Centex three-peat with a late comeback 15-13 victory over a resilient #9 Ohio State Fever. It was a rematch of the Centex final in 2017, a game that ended as a 15-3 blowout, and this game actually started similarly to that one. But where last year Ohio State wilted against Texas, the 2018 final featured far more twists and turns in a thrilling second half to cap off the weekend in Austin. The game’s first two points were both clean holds. There wouldn’t be another until it was 6-1. Texas did get a couple blocks in that stretch, but it was primarily simple execution errors that plagued Ohio State. Drops and throwaways very early in their possessions gave Texas short fields to work with and they were ruthless with them. Caroline O’Connell and Ivy Harrison were big factors in the Melee run, as the two combined for five total goals and assists during the four point stretch. Texas started three for three on break chances, and finished four for five in the points that saw them build the 6-1 lead. But then Ohio State snapped out of it. They played a perfect point for 6-2, and after Corinn Pruitt intercepted a Domenica Sutherland pass on the Ohio State goal line, they were perfect again for the full field break to make it 6-3. Both teams held out to halftime with Texas leading 8-4, but that little flip for Fever was an indication of their second half performance. The first three points out of the half were all holds, but the intensity of those points felt higher than the first half. Texas’ Marissa Land and Alex Magid, along with Ohio State’s Annelise Peters and Sadie Jezierski, contributed highlight blocks despite the offensive units getting the goals. The intensity only rose when Ohio State broke on each of the next two points. The host team took their turn with sloppy play, as they struggled to cope with the zone defense Ohio State brought out in the second half. A drop at 9-6 and a throwaway at 9-7 gave Ohio State the only break chances they needed. Jezierski assisted for both breaks, while Emily Barrett scored the hold and the second break, and just like that it was 9-8. Next it was Sutherland’s chance to take over for a few points. She assisted for the Texas hold to make it 10-8, she assisted on the Texas break for 11-8, and she assisted again when Texas held for 12-9. All three Texas possessions on those points were turnover free, and it looked as though they’d quashed the Ohio State momentum. Melee had a chance to put the game away for good on the next point, but they missed on three break chances, including one that started just a few yards outside the end zone. Ohio State held on for 12-10. Surviving that scare seemed to put a jolt of energy into Ohio State defensively. Pruitt got another block on a Sutherland pass and completed the bookends when she hauled in a hammer from Jezierski t make it 12-11. Ohio State broke again to make it 12-12 off of a Texas throwaway when Peters hit Emily Barrett for her fifth goal of the half. Ohio State kept the run going when Pruitt notched another block and Peters found Jezierski to make it 13-12, the first Ohio State lead of the game. Texas was shellshocked. They’d let a 6-1 lead and 8-4 halftime advantage turn into a 13-12 deficit. The team called timeout to settle things down. Texas’ offense didn’t immediately respond well, turning it twice. But they were able to eventually get the hold, as Laura Gerencser beat her mark strike to reel in the goal to make it 13-13. Sutherland was able to make up for her turnovers in the Ohio State run with a huge layout block in her own red zone. 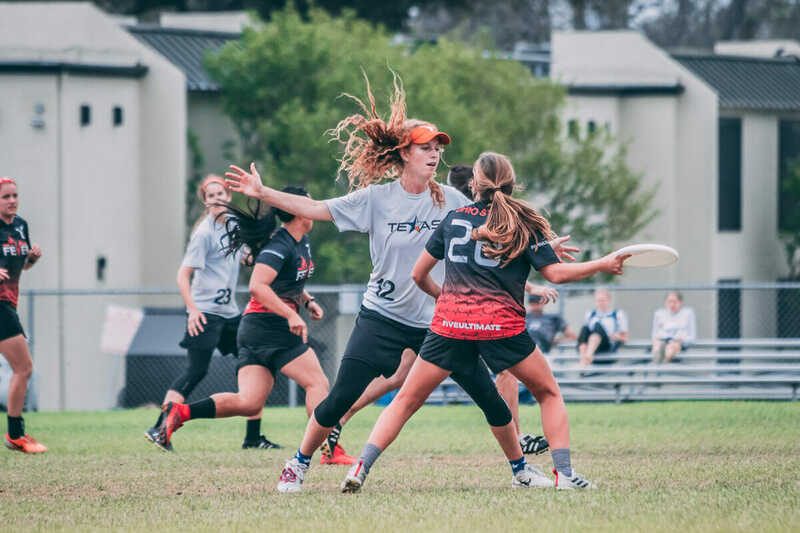 It later looked as though Pruitt had earned the disc back for Fever, but her block popped the disc back in the air for Land to chase down. Texas immediately had their lead back, 14-13. Ohio State turned it over in the far red zone again when Jezierski and Peters couldn’t connect on a reset. Texas worked it the other way and Sutherland hit Harrison with her fourth assist of the half for the game winning goal. It was a game of huge momentum swings and stretches of individual brilliance on both teams. But the game’s two biggest swings were due to Ohio State’s switch to a zone, and Texas’ late game mental fortitude. That mental click was enough for one last momentum swing when it mattered most. They were the ones to find that one final surge, and as a result they took their third straight Centex title. Comments on "Texas Survives Momentum Swings to Beat Ohio State in Centex Final"